Game time is finally about to arrive! 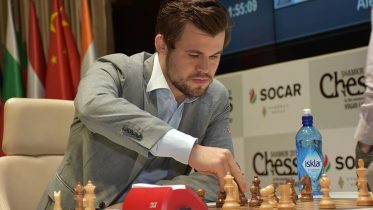 Nigel Short believes Magnus Carlsen can become one of the best players in history if he takes his third straight world title. The event of the year draws ever closer – on 11/11 the world title match between Magnus Carlsen and challenger Sergey Karjakin kicks off. Unsurprisingly, news tidbits are now coming thick and fast as various factions start to ratchet up the excitement. Here is an overview of the latest developments. Norwegian sports reporter Kaja Snare has been headhunted to become the international TV reporter for organizer Agon’s live coverage of the Carlsen-Karjakin title match in New York. The World Chess Federation could face serious financial trouble. 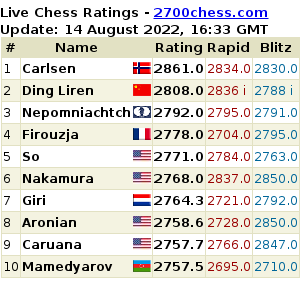 We’re in the middle of the summer, which means things are starting to heat up in the chess world. Matt & Patt’s columnist takes a look at recent events. Matt & Patt contributor GM Jonathan Tisdall updates on some recent chess events.